I still remember when I got an email from LinkedIn with the subject line, “You’re invited to publish on LinkedIn”…. I still remember when I got an email from LinkedIn with the subject line, “You’re invited to publish on LinkedIn”. Squinting in the early morning hours at my illuminated phone in my dark bedroom, I felt a wave of excitement as I envisioned LinkedIn selecting me as a part of a small, unique group of “Influencers”. That was last winter. Ten posts and 1,450 followers later, my most recent articles have racked up between 2-3,000 views, 40 likes, and 15 comments. And that’s not including a viral post about phone privacy that reached 77,816 views, 401 likes, and 227 comments in one day. But, LinkedIn never “chose me” to be part of the LinkedIn Influencer program. I was simply one of the first to be invited to publish after LinkedIn opened up its publishing platform to their entire network, over 275 million users. This means you can create a viral post on LinkedIn too, and whether you’re a marketing professional, thought leader, or just someone who has something important to say, LinkedIn provides you with the potential to make incredible waves and probably reach more new people, more easily than you were ever able. A title grabs readers’ attention in a busy landscape of posts. Which is why a clear, powerful headline that promises to deliver value to the reader is known to count for as much as 60% of the overall success of a post on LinkedIn. Length is one of the biggest factors to consider when choosing a title and for decades authors have been pondering the magic number for a title’s length. Judging from our data, it seems that titles between 26-40 characters are the most widely viewed, shared, and liked–with all 3 of those KPIs aligning perfectly in a sharp rise at that very same number length. A title of that length is eye-catching, easy to comprehend and quick, yet detailed enough to relay a solid idea. Which is why, if you look at the title of this post, it’s only 37 characters. So, what words resonate most with readers? Our data shows that the top tokens in 2014 according to the number of views are all work and career related words, such as: interview, job, people, work, success, and culture. Also, we see that putting numbers like top 5 or 10 attracts readers as it also appears high on viewed tokens. In 2013, similar words ranked: job, team, company, work, career, and tips. In line with our findings, we see that the top read article in 2014 so far is: 10 Reasons You Have To Quit Your Job In 2014, with close to 1.5 million views as of now and 25,000 shares. Another career-related article, “The Difference Between Successful People and Unsuccessful People” comes in as the top second viewed and shared article on LinkedIn, followed by: “The 7 Things Successful People Never Say”, “Job Interview: Why Only 3 Questions Really Matter”, and “The No. 1 Time Management Mistake”. Using our dashboard as a guide is a great way to research topic ideas for your next writing endeavor. Hint: you probably to relate it to jobs. Apparently, the day of the week also determines if people are more likely to click and read a positive or negative title to a post. 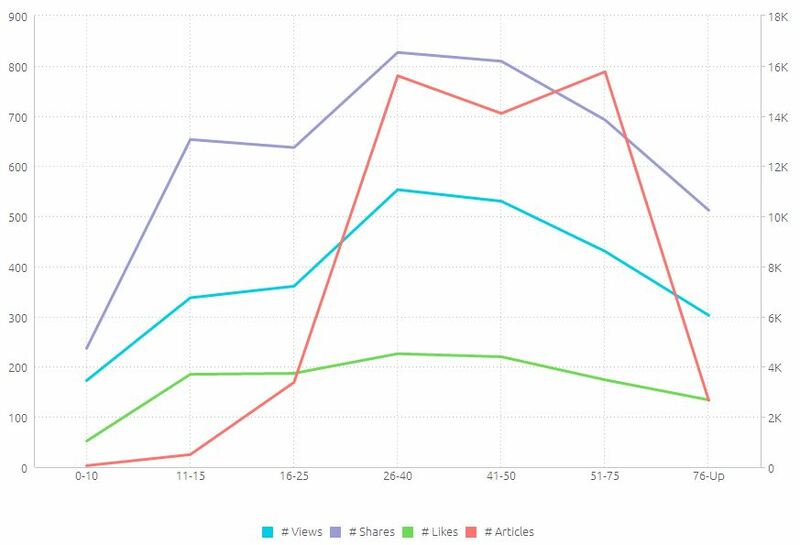 If you examine the outliers in the bubble graph, the middle of the week (Monday and Wednesday), are the best days to share articles with a negative title. 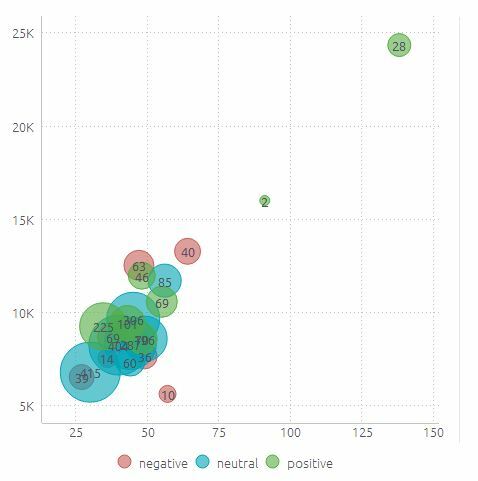 On the flipside, during the weekend, most notably on Saturdays, readers are more likely to click and read on positive posts. We can hypothesize that this is because people have a more positive outlook during the weekend, and experience more downs midweek when the emotional high fades from the previous weekend fades, and the next weekend seems far. Or, maybe lonely readers are trying to stay positive on the weekend by viewing positive posts, while during the busy week, reading a negative post is less detrimental? Either way: if you have something to say that may be a bit bleak, critical or generally more negative, save it for midweek and vice versa for your upbeat posts. Start setting your expectations and refer back to this dashboard in order to see how your post performed in relation to the median. Analyzing the data of 2,600 posts in 2014, it appears that if your post exceeds 9,300 views, 735 shares, and 198 likes, you are doing better than 50% of all posts on LinkedIn. Pretty good. But, do you know what’s more powerful than reaching 275 million people on LinkedIn? Reaching the right 275 people, and getting your message across to each and every one of them. Have any idea why these insights might be so? Let me know in the comments below. To learn more about building a data dashboard, click here.